The Thomas Paine Foundation/Memorial Committee began as a separate organization (formerly simply the Thomas Paine Foundation) created by Margaret Downey, which was then adopted by the Freethought Society as a standing committee. Through the committee, the Freethought Society conducts educational and entertaining programs promoting the ideals of Thomas Paine and freethought philosophy. The committee has received local, national and international recognition for its efforts. See photos from the committee’s events and gatherings here! A musical compilation of Thomas Paine themed songs written and performed by James Klueh. Please make a donation to help us fund these wonderful Thomas Paine projects. All donors are issued a receipt as proof of their tax-exempt donation to an educational, charitable 501(c)(3) organization. 3. Set up a recurring monthly donation through PayPal! It’s easy and there are no service charges to you. Recurring donations guarantee a constant source of income for FS. Subscribe at the $10/mo. level or more and get a free t-shirt of your choice, chosen from our online store (see link at top of page). You will be contacted after we receive notice of your subscription. All recurring contributors will receive a thank you card at the end of their 12-month subscription which will report the total amount given that year. Additional receipts available at any time upon request. Thomas Paine arrived in America in 1774 at the request of Benjamin Franklin. On January 10, 1776, Paine published Common Sense, a remarkable and powerful republican pamphlet, which proved an immediate success. Paine served in the Revolutionary War under General Greene, and later in official congressionally-appointed positions and the Pennsylvania legislature. 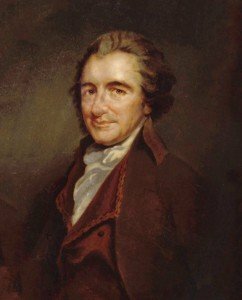 In his later publication, Age of Reason, Paine expressed that “all religions are in their nature mild and benign” when not associated with political systems; Paine was the quintessential Deist of the 18th century. Between March 1791 and February 1792 Paine published numerous editions of Rights of Man, in which he defended the French Revolution. The words of Thomas Paine inspired many to strive for political, economic and social advancement. He was among the first to call for an end to slavery and the establishment of human rights around the world. In appreciation, the Thomas Paine Foundation/Memorial Committee celebrates the birthday of Thomas Paine on January 29th, as well as a Thomas Paine Day proclamation on June 8 and other Paine-themed events during the year. The committee is a participant in the beautification project for the Thomas Paine National Historical Museum, located at what was once Paine’s farm in New Rochelle, NY. Read all about the committee’s 20th anniversary Thomas Paine Day 2014! Five Thomas Paine assemblies have been presented at elementary schools throughout the Delaware Valley region. Assemblies have also taken place in New Jersey and California. If you are a teacher or school administrator, you may apply for a Thomas Paine Assembly Grant. Send your completed application to Margaret Downey at the email address below. Donations towards the production costs and supplies needed for these assemblies can be made online at https://www.ftsociety.org/donate; just note your earmark for either Paine Assemblies or the Thomas Paine Committee in general in the message field at the PayPal payment page. All donors will receive a receipt. FS is recognized by the IRS as a 501(c)(3) educational, charitable organization*.